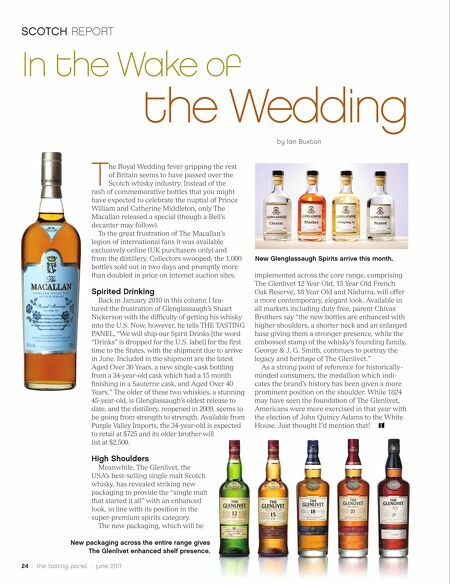 ScOTch REpORT In the Wake of the Wedding by Ian Buxton T he Royal Wedding fever gripping the rest of Britain seems to have passed over the Scotch whisky industry. Instead of the rash of commemorative bottles that you might have expected to celebrate the nuptial of Prince William and Catherine Middleton, only The Macallan released a special (though a Bell’s decanter may follow). To the great frustration of The Macallan’s legion of international fans it was available exclusively online (UK purchasers only) and from the distillery. 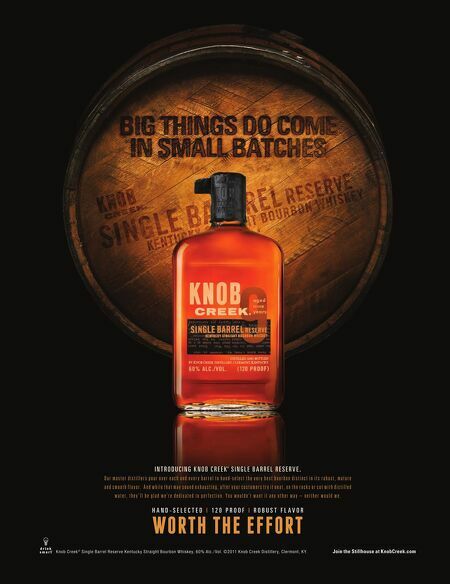 Collectors swooped; the 1,000 bottles sold out in two days and promptly more than doubled in price on internet auction sites. Spirited Drinking Back in January 2010 in this column I fea- tured the frustration of Glenglassaugh’s Stuart Nickerson with the difficulty of getting his whisky into the U.S. Now, however, he tells THE TASTING PANEL, “We will ship our Spirit Drinks [the word “Drinks” is dropped for the U.S. label] for the first time to the States, with the shipment due to arrive in June. Included in the shipment are the latest Aged Over 30 Years, a new single-cask bottling from a 34-year-old cask which had a 15 month finishing in a Sauterne cask, and Aged Over 40 Years.” The older of these two whiskies, a stunning 45-year-old, is Glenglassaugh’s oldest release to date, and the distillery, reopened in 2009, seems to be going from strength to strength. Available from Purple Valley Imports, the 34-year-old is expected to retail at $725 and its older brother will list at $2,500. High Shoulders Meanwhile, The Glenlivet, the USA’s best-selling single malt Scotch whisky, has revealed striking new packaging to provide the “single malt that started it all” with an enhanced look, in line with its position in the super-premium spirits category. The new packaging, which will be New packaging across the entire range gives The Glenlivet enhanced shelf presence. 2 / the tasting panel / june 201 1 New Glenglassaugh Spirits arrive this month. implemented across the core range, comprising The Glenlivet 12 Year Old, 15 Year Old French Oak Reserve, 18 Year Old and Nàdurra, will offer a more contemporary, elegant look. Available in all markets including duty free, parent Chivas Brothers say “the new bottles are enhanced with higher shoulders, a shorter neck and an enlarged base giving them a stronger presence, while the embossed stamp of the whisky’s founding family, George & J. G. Smith, continues to portray the legacy and heritage of The Glenlivet.” As a strong point of reference for historically- minded consumers, the medallion which indi- cates the brand’s history has been given a more prominent position on the shoulder. While 1824 may have seen the foundation of The Glenlivet, Americans were more exercised in that year with the election of John Quincy Adams to the White House. Just thought I’d mention that!